With the continuing unsettled spring weather in the Pacific NW, it was time to head south once again towards Mount Shasta. The forecast for Thursday, June 9, showed a brief weather window in the southern WA and OR Cascades, so I planned to ski the NW side of Middle Sister on the way down south. However, I didn't leave Seattle on Wednesday evening as planned, and by 6 AM Thursday morning there was no time left to make the long drive to central Oregon and then ski, so I needed a backup plan. David Coleman and I had planned to ski the Pinnacle and lower Adams Glaciers on Mount Adams the previous weekend, but that trip never left town. I decided to give it a shot solo, even though the planned route would definitely be safer with a partner (even though the lower portions of both glaciers are relatively uncrevassed and safe on skis). The drive down to Randle was mostly sunny, but the first views of Mount Adams revealed lenticular clouds obscuring the summit. Nothing to worry about, I thought, since I wasn't planning to go above about 9500 ft on either glacier. Unfortunately, the photo below taken from Takhlakh Lake shows the clearest weather by far of the entire day. By the time I left the 4700 ft Divide Camp trailhead after 10 AM, high clouds were overhead. The Divide Camp trail is excellent, smooth and straight and fast, I like it much more than the Killen Creek trail (and it's much faster for reaching the Adams or Pinnacle Glaciers). The sky was mostly cloudy and the mountain nearly obscured when I reached the first clearing at 5600 ft Divide Meadow. Right in the middle of the meadow is a surprising artifact, a roughly 27-ft high steel pole with aluminum rungs at 2-ft intervals and larger rungs at 10 ft intervals. This is an aerial marker for measuring snow depth at the Divide Meadows snow course which was active from 1962-1978 (see NRCS Snow Surveys and a table of historical data). The maximum snow depth ever recorded here was 222" on March 7, 1972, still far below the top of the marker. It's a shame that measurements were discontinued nearly 3 decades ago. I soon reached continuous skiable snow by 5900 ft, about an hour and 2.7 miles from the car. There's much more snow now at 6000 ft on the NW side of Adams than there was on the north side 2 weeks earlier (see TAY report). I skinned up heading SE, quickly passing the trail junction with the PCT. Generally there was 2-3 ft of well-consolidated old snow, topped with a layer of several inches of partly-consolidated new snow from a couple days earlier. I angled farther and farther right (SSE) to try to gain the main lobe of the Pinnacle Glacier, but clouds continued to lower and obscure any reference points on the upper mountain (I was glad to have brought my GPS). The entire area is a moonscape of old glacial moraines, studded with occasional clusters of trees up to about 7000 ft. Off to the southwest, I could look below the cloud deck and see clear skies and sunshine in the distance, offering hope for a possible improvement in the weather. I followed generally continuous snow with only a few short bare patches of moraine to skin across near 7000 ft, ending up in the drainage of the nearly-vanished northern lobe of the Pinnacle Glacier. I passed a pair of small frozen moraine-dammed lakes, ringed by remnants of the mostly receded glacier. An interesting englacial stream ran through the moraines and glacial remnants. A sucker hole finally opened to reveal views of the upper Adams Glacier, but then a whiteout engulfed me and visibility dropped below 100 ft. Luckily the winds were calm, so I decided to just sit on my pack and wait it out at 7400 ft. And I waited and waited, nearly an hour, when finally the clouds lifted and I quickly headed up again. Unfortunately, the partial clearing lasted barely 15 minutes, just long enough to reach the 7600+ ft moraine saddle beside Point 7699, right at the edge of the Pinnacle Glacier. Another whiteout, more sitting and waiting, then finally lying down and napping atop my pack. Occasionally, the distant sound of large rockfalls off the Pinnacle Headwall interrupted my snooze. The hours passed, and I knew the day was done. At nearly 4 PM, the whiteout thinned and visibility was good below the cloud deck. I knew I had to make my escape now. I quickly skied back down, generally straight-lining my skin track and occasionally carving some turns in the granular snow on steeper pitches. Skied and traversed back down to 5900 ft, put on my hiking boots, and took off down the trail. It was a disappointing day with the uncooperative weather, but at least I didn't get rained on. I'll have to return sometime and more fully explore the interesting glacial terrain on the NW flank of Mount Adams. 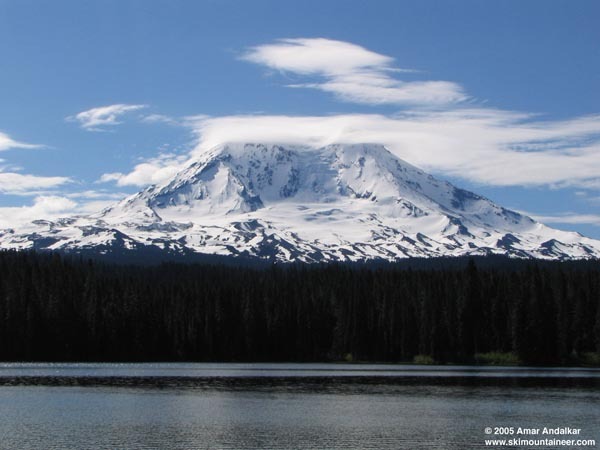 Mount Adams seen from Takhlakh Lake, 7 miles NW of the summit, showing the best weather of the day. The Adams Glacier is in the center, with the Pinnacle Glacier just below the right skyline (West Ridge). The Divide Camp trailhead is straight ahead, 1 mile closer to the mountain, and the trail leads directly towards the Adams Glacier.